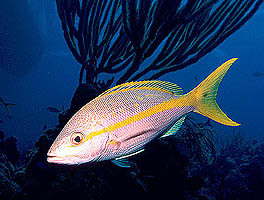 I love this wide-angle shot of this Yellowtail Snapper swimming in front of the dropoff at Silver Caves Reef in Belize. Click here to learn more. 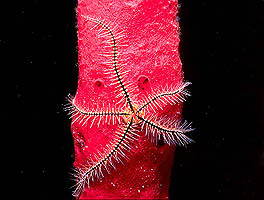 Possibly the best photo I've ever taken, the colors of this Sponge Brittle Star on a Red Rope Sponge are incredible. Click here to learn all about it.